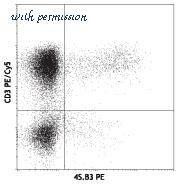 Purified human CD4+ T cells were left non-stimulated (Lane 1), stimulated with anti-CD3 (Lane 2), or stimulated with anti-CD3 and anti-CD28 (Lane 3) for three days. IFN? production (pg/ml) was determined by ELISA by coating M700A (1:1000), blocking with 1% BSA in PBS, and detection with M701B (1:1000), followed by peroxidase-conjugated avidin and TMB substrate. Data courtesy of Innovators Program. IFN-gamma Inhibition of EMCV-induced Cytopathy and Neutralization by Human IFN-gamma Antibody. Recombinant Human IFN-gamma (Catalog # 285-IF ) reduces the Encephalomyocarditis Virus (EMCV)-induced cytopathy in the HeLa human cervical epithelial carcinoma cell line in a dose-dependent manner (orange line), as measured by crystal violet staining. 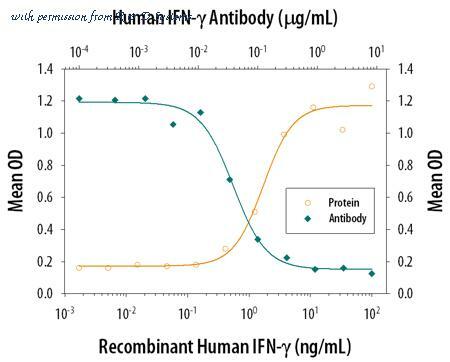 Inhibition of EMCV activity elicited by Recombinant Human IFN-gamma (1 ng/mL) is neutralized (green line) by increasing concentrations of Human IFN-gamma Monoclonal Antibody (Catalog # MAB285). The ND50 is typically 0.02-0.06 ╡g/mL. 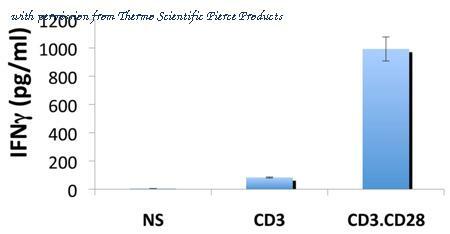 Detection of IFN-gamma in Human PBMCs by Flow Cytometry. Human peripheral blood mononuclear cells (PBMCs) treated with 50 ng/mL PMA, 1 ug/mL Ionomycin, and 3 uM Monensin overnight were stained with Mouse Anti-Human CD3 epsilon APC-conjugated Monoclonal Antibody (Catalog # FAB100A ) and either (A) Mouse Anti-Human IFN-gamma PE-conjugated Monoclonal Antibody (Catalog # IC285P) or (B) Mouse IgG2B Phycoerythrin Isotype Control (Catalog # IC0041P ). To facilitate intracellular staining, cells were fixed and permeabilized with FlowX FoxP3 Fixation Permeabilization Buffer Kit (Catalog # FC012 ). View our protocol for Staining Intracellular Molecules . 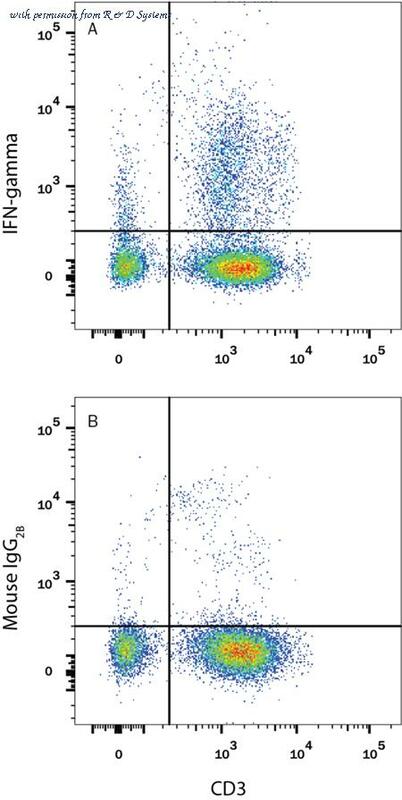 IFN-gamma Inhibition of EMCV-induced Cytopathy and Neutralization by Human IFN-gamma Antibody. Recombinant Human IFN-gamma (Catalog # 285-IF ) reduces the Encephalomyocarditis Virus (EMCV)-induced cytopathy in the HeLa human cervical epithelial carcinoma cell line in a dose-dependent manner (orange line), as measured by crystal violet staining. 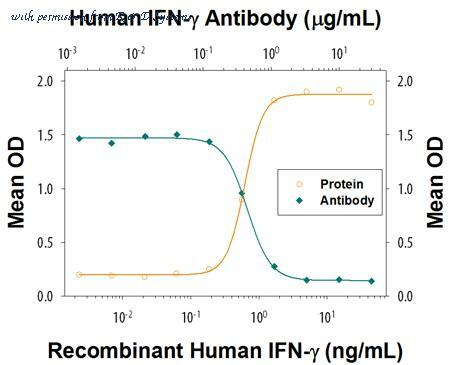 Inhibition of EMCV activity elicited by Recombinant Human IFN-gamma (1 ng/mL) is neutralized (green line) by increasing concentrations of Mouse Anti-Human IFN-gamma Monoclonal Antibody (Catalog # MAB2852). The ND50 is typically <=2 ╡g/mL. Published customer image: Biotinylated Mouse anti Bovine interferon gamma antibody, clone CC302 ( MCA1783B ) used as a detection reagent in conjunction with Mouse anti Bovine interferon gamma antibody, clone CC330 ( MCA2112 ) as a capture reagent in a sandwich ELISA to evaluate ovine ifn-γ responses following T. gondii infection. Image caption: . IFN-gamma response (log10 scale) in mesenteric lymph nodes, Peyer’s Patches, popliteal LN and PBMC against GRA7, TLA and MIC3 in function of time. 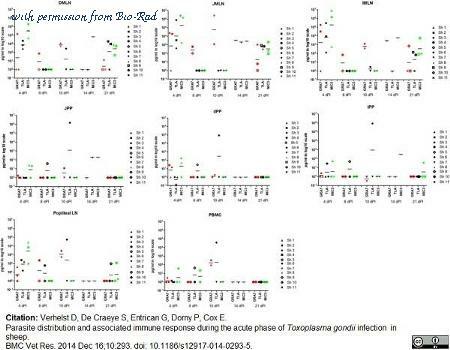 From: Verhelst D, De Craeye S, Entrican G, Dorny P, Cox E. Parasite distribution and associated immune response during the acute phase of Toxoplasma gondii infection in sheep. BMC Vet Res. 2014 Dec 16;10: 293 . This is from an open access article distributed under the terms of the Creative Commons Attribution License . Western blot of IFN-gamma monoclonal antibody against truncated IFN-gamma recombinant protein. PMA/Ionomycin-stimulated human PBMCs were stained with CD3 PE/Cy5 and 4S. B3 PE. 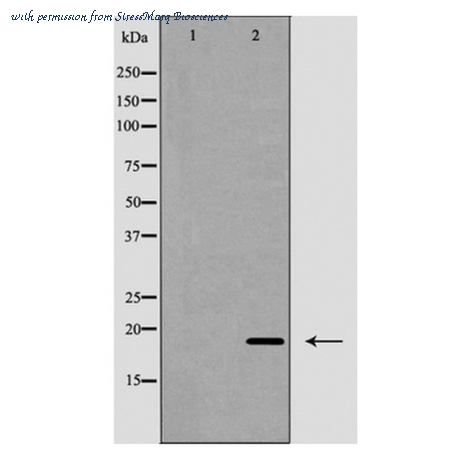 Western blot analysis of Human HepG2 cell lysates showing detection of ~19kDa IFN gamma protein using Rabbit Anti-IFN gamma Polyclonal Antibody (SPC-1297). Lane 1: Human HepG2 cell lysate treated with the immunizing peptide. Lane 2: Human HepG2 cell lysate. 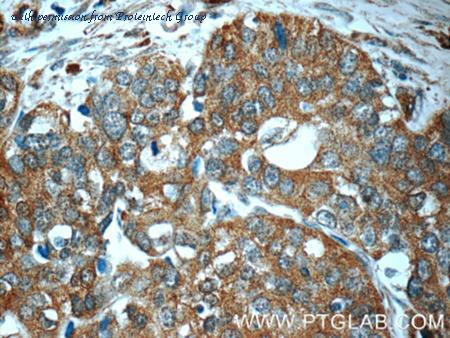 Primary Antibody: Rabbit Anti-IFN gamma Polyclonal Antibody (SPC-1297) at 1:1000. Predicted/Observed Size: ~19kDa.